Hitting from behind is a very dangerous part of our game and as coaches, I think we can do a better job of preventing this from happening. Hitting from behind can be broken into two categories. The first one is intentional. This hit has to be addressed by the coach immediately and the player needs to understand there is no room for this in our game. The second one is the one I want to address is the accidental one. From my experience, most of the hits from behind fall into this category and they can be corrected in practice. As coaches, we need to do a better job of teaching the players proper puck retrieval and player pursuit. Proper puck retrieval needs to be taught right from the beginning at the 8U level. Players need to understand you curl into a puck and you do not skate directly at the puck. If players are taught this skill early, keeping their skates parallel to the boards when picking up the puck, we can minimize the chances they are hit from behind. As a player approaches the wall to pick up a puck, they need to be taught to look over their shoulder twice before getting to it. This way, they can see where the pressure is coming from and where their teammates are for support. With this awareness, they can now take a better angle into the wall and pick up the puck, keeping their skates parallel to the wall. Doing these things will help puck carrier to protect themselves and to prepare for the pressure or the hit that is coming. Along with these skills, we need to teach players not to lower their heads and make unsafe turns that expose them to the hit from behind. As coaches, I believe we need to also teach the proper way to pressure the puck and pursue the puck carrier. Players need to be taught to pressure the puck carrier from a shoulder and not from the numbers. This will put them in a better position to angle out the puck carrier and gain control of the puck. This will decrease the chances of the player hitting the puck carrier from behind. Along with proper angling, it needs to be stressed to keep their hands down and stick on the ice when engaging the opposing player. We need to stress the importance of the stick in angling and proper body contact. The stick can be used to steer the puck carrier where you want him to go as you approach and then, they can be safely angled into the wall. By keeping the stick on the ice, we minimize chances of taking a penalty and keeps our arms down, which will make us more effective going to battle for the puck. We also need to continue to teach respect for the players and the game. There are times players will end up in a bad position and the hit from behind will happen. The player being hit needs to remember to stay upright and the player coming in from behind needs to remember to not extend arms and drive player into the boards. This player needs to be taught to keep their hands down and just pin the player against wall. If we teach all players the proper way to pick up a puck from the wall and the proper way to pressure a puck carrier, we can minimize the unintentional hit from behind. These skills need to be taught at Mite. We can’t wait to teach angling and proper puck retrieval as well as body contact against the boards. These are very important skills that are necessary for the players to advance in the game and I believe they also make the players safer and more aware when playing against the boards. 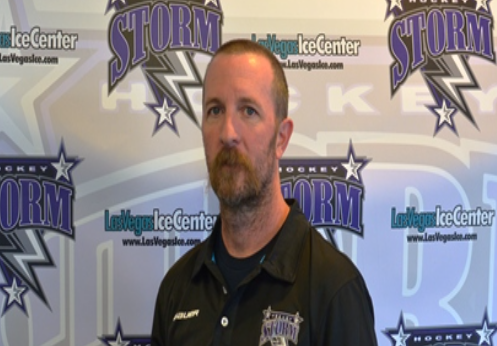 Dell Truax is the Nevada Storm’s Pee Wee AA head coach.